With an active 3.5 year old and a 9 month old who is in that get-into-everything-and-put-everything-into-my-mouth phase, it's an understatement to say we're ready for spring. I'm really looking forward to mornings at the park, trips to the zoo, picnics outside, running through the sprinkler, etc. But spring also brings along its rainy days. For the days that we're stuck inside, I'd like to use our time more creatively. (Not saying I always will or always do; just saying I'd like to more often.) 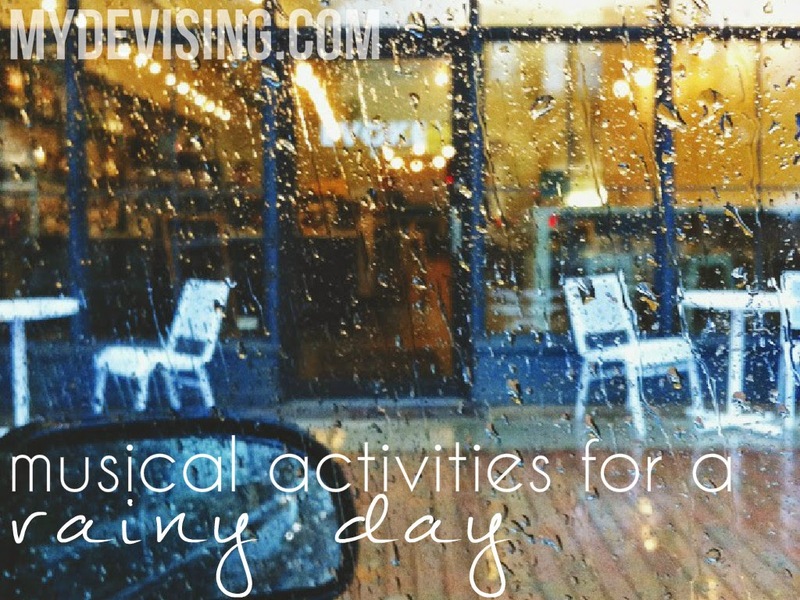 I looked around for a few rainy day musical activities that would be fun to do with young children. Some of them I've done in the classroom, and some are new to me. I hope you find them helpful and enjoyable on the days when the rain keeps you inside! It's Raining, It's Pouring - We all know and love this one. We can sing it to our littles while flipping through the pages of this book. Rainy Day Nursery Rhymes - This website is full of songs, free printables, and activites centered around rainy day nursery rhymes. This is a great resource! The Tree Song - This is one of my most favorite songs to do with little kids. It goes through each of the seasons and what happens to the trees as the weather changes. I have certain motions I do as we sing the song, but any motions will work. Children love it! Read about where rain comes from and how the water cycle works. Create rain sounds with instruments. For example, use the triangle and jingle bells for light rain sounds. Add the rhythm sticks and tone block for a bit louder sound. Finally, play the tambourine and cymbals as you imagine the lightning and thunder. Don't have any instruments? Make up your own! Banging on pots and pans is just as good! This website offers some really great ideas for making your own instruments at home. Learn to make rain with body percussion. Turn the lights off and start with the lightest sounds of rain with your body (snaps, light claps). Allow the sound to grow as you add pats, claps, and stomps. Then, gradually lessen the sound and return to the light drip-drop that started it. As you can imagine, this is most fun when you have a group of people to do it with! Kids love hearing all of the sounds going at once.